The red centre has been set ablaze again with the fourth annual Broken Heel Festival booming and breaking records over the weekend. The four-day festival is a celebration of the appearance of Broken Hill – aka the ‘Silver City’ – in 1994 cult movie The Adventures of Priscilla, Queen of the Desert. 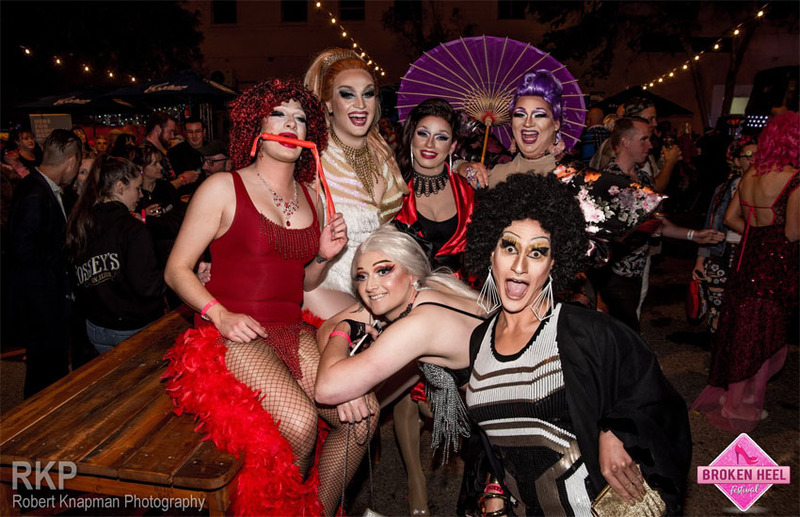 This year’s festival drew an estimated record crowd of over 6,500 to the line-up of events, seeing drag queens party in the streets with locals and those that made the pilgrimage to the mining town, around 1,200 kilometres west of Sydney, from across the country and around the world. 2018 saw the second-ever journey of the ‘specially commissioned NSW TrainLink Silver City Stiletto Express, delivering revellers to the procession of performances, parties, a grand street parade, and “plenty of fun and high-camp lust in the dust”. The programme included the Palace Hotel’s outdoor festival, heritage laneway galleries, and Saturday’s parade down the main ‘drag’ that saw 2,500 people line Argent Street to watch the costumes and floats, including the Festival’s own Mardi Gras float – a 5-metre stiletto, adorned with 15 dazzling queens. The weekend gave rise to two new rising starlets courtesy of the indigenous mentorship between the BHF and upcoming ‘Black Divas’ Felicia Foxx and Jojo Zaho, who performed to and wowed the audiences. Festivities climaxed on Saturday night as 1,700 revellers crowded the iconic Palace – featured in the movie – to enjoy performances by Christine Anu, Dolly Diamond, Leather Lungs, international DJ Kityy Glitter, and “a glitterati of classic drag performers”. “Next year will be 25 years since the release of The Adventures of Priscilla, Queen of the Desert, and already tickets are selling for what promises to be an even more spectacular event.